Colin Lyons: A Modern Cult of Monuments. Installation view. Photo credit: Karen Asher. Courtesy Ace Art Inc.	Colin Lyons: The Alchemist (2012). Zinc, copper, plexigrass, steel, copper sulphate, cast tin, wire. Photo credit: Karen Asher. Courtesy Ace Art Inc.	Colin Lyons: New Monuments/Old Foundations (2015). Concrete foundations, levigator, carborundum. Video: Devon Lindsay. Photo credit: Karen Asher. Courtesy of Ace Art Inc.	Colin Lyons: Anode Cathode (2014–2016). Zinc and copper etching plates, copper sulphate. Photo credit: Karen Asher. 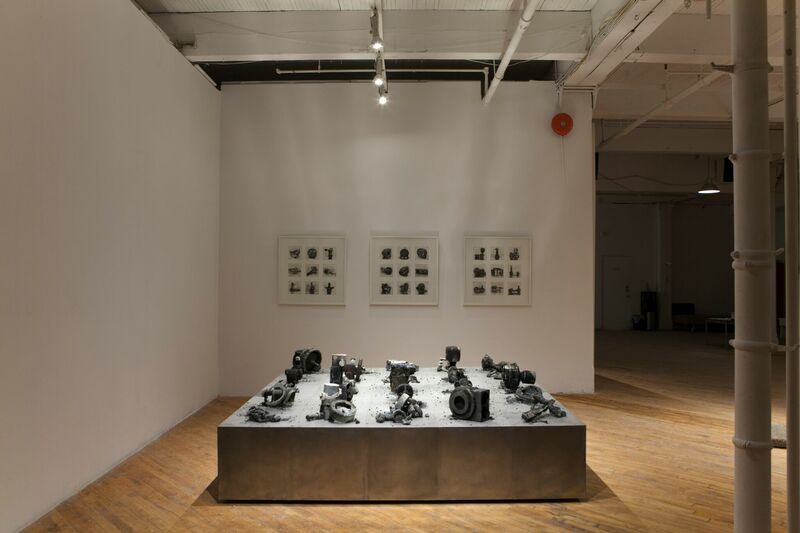 Courtesy Ace Art Inc.	Colin Lyons: Automatic Ruins (2011–2013). Zinc etching plates, copper sulphate, galvanized steel. Photo credit: Karen Asher. 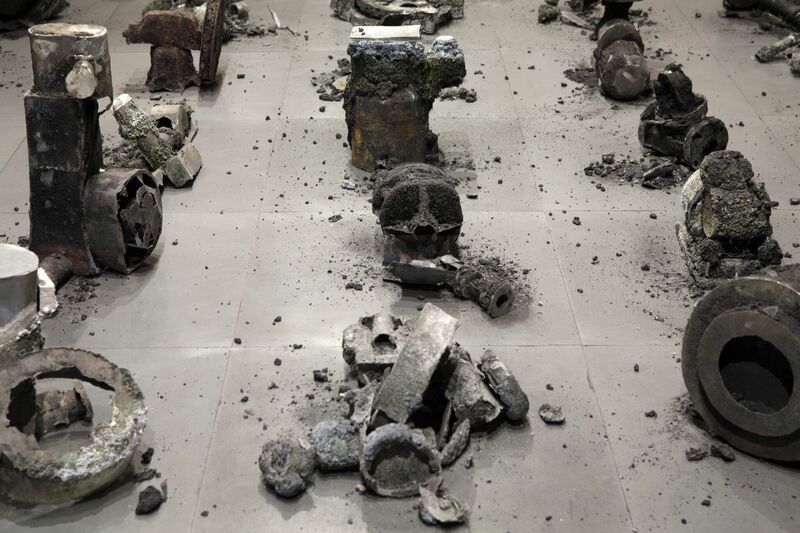 Courtesy Ace Art Inc.	Colin Lyons: Automatic Ruins (2011–2013) (detail). 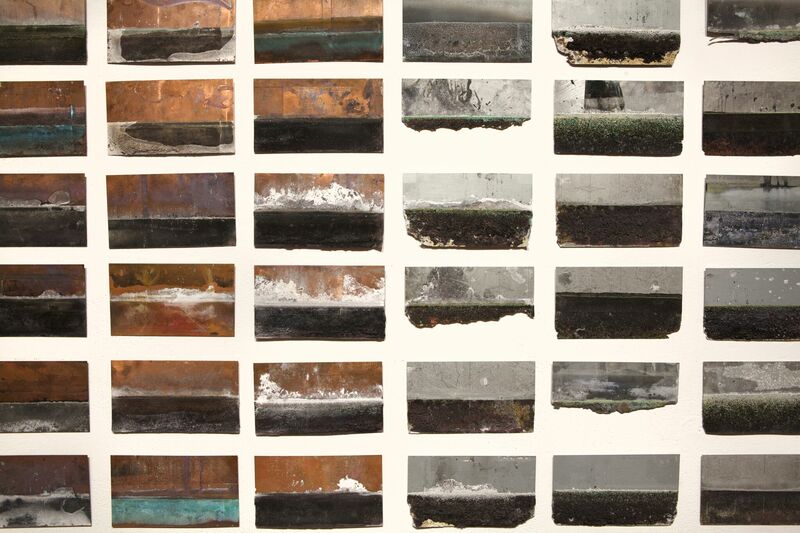 Zinc etching plates, copper sulphate, galvanized steel. Photo credit: Karen Asher. Courtesy Ace Art Inc.
Colin Lyons employs his medium with what I can only call dogged rigour. He weaves the vocabulary of printmaking with histories of industrialization to allude to destruction, restoration, and obsolescence. With the fastidious touch of a skilled technician, he aligns the very material of his craft to a wider historical lineage, drawing parallels between labour and creative production. 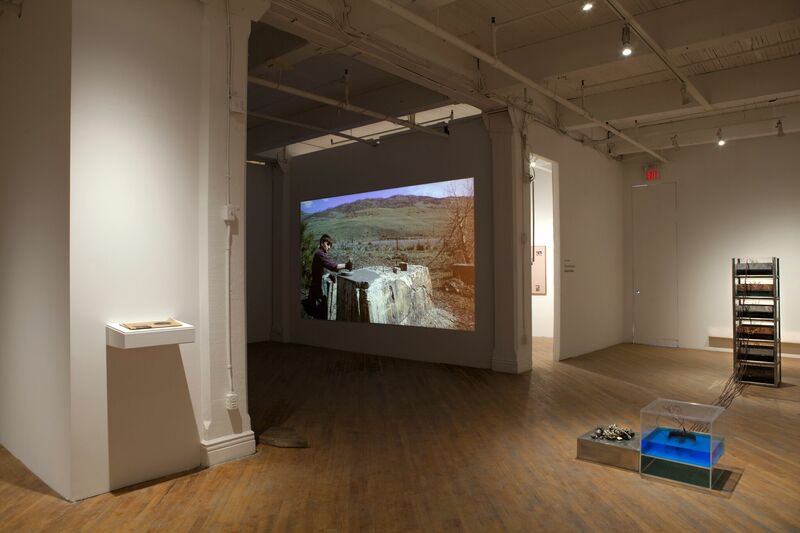 The most recent iteration of this exacting approach is the grandiosely-titled A Modern Cult of Monuments at Winnipeg’s Ace Art Inc., a multi-media exhibition depicting his excavation of a nearly forgotten factory site on the outskirts of Kamloops. Using methods particular to etching and lithography, Lyons augments artefacts found at the site and presents them in an artfully arranged installation. But even with the show’s parallel themes and far-reaching ideas, at heart seems to lie Lyons’ concern with medium specificity and the question of its obsolescence in an interdisciplinary art world. In his 2005 essay in Afterall, “Why are conceptual artists painting again? 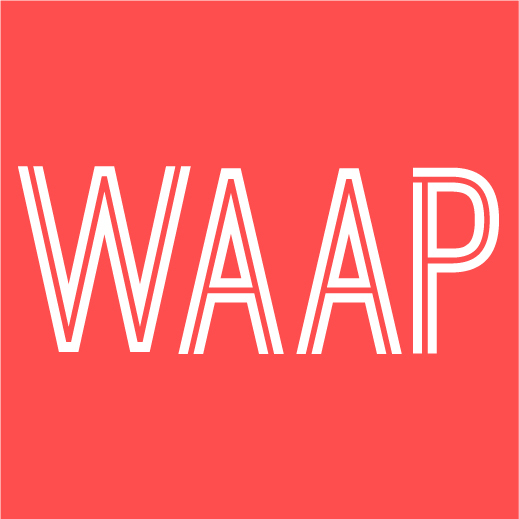 Because it’s a good idea,” Jan Verwoert asks, “[W]hich forms of artistic production can count as contemporary and which should be rejected as irrelevant?” His question is aimed at medium specificity. In what Rosalind Krauss calls the “post-medium condition,” Verwoert argues the conceptual gesture has become the artistic strategy of choice. Instead of exploring the limits and possibilities of a given medium, the artist might use it as, among other things, a means through which to occupy a position in relation to the art institution and art history. A way of presenting painting as a conceptual gesture, for example, has been to show it as one element of an installation. In this way it occupies an interchangeable (rather than hierarchical) position. It was only upon repeated viewings of Lyons’ exhibition that Verwoert’s arguments began to surface in my reading of the work. It seems to me that the artist’s use of installation, as well as the narrative of industrial history, occupies a position secondary to the medium, which structures Lyons’ show both literally and figuratively. The former is evidenced through the techniques and materials Lyons uses, while the latter can be found in the metaphors between the printmaking process and obsolete industrial sites and technologies. 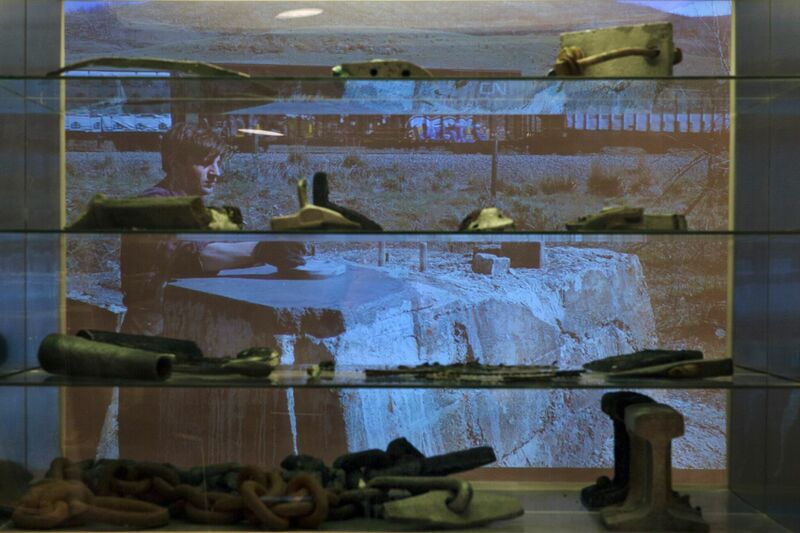 In New Monuments/Old Foundations (2015), a video teetering between farce and stoic sincerity, Lyons uses a levigator, the trademark tool of lithography, to polish the remnants of the foundation at the Kamloops site. Purposefully littered around the gallery are partially polished chunks of concrete from another industrial site in Cleveland. Printed onto their smooth surfaces are blueprints for the site’s renovation into a brewery. On one wall hangs a grid of degraded copper plates. Beside them stands a tank filled with etching fluid in which the next addition to the series slowly corrodes. Other printmaking materials include zinc etching plates used to build a low-lying plinth, an artificially-aged newspaper-like publication onto which Lyons’ emails are printed, as well as a low, narrow copper shelf upon which two corroded objects are perched. New Monuments/Old Foundations seems to cast the artist as a sort of Byronic hero—a cynical, melancholy man who remains capable of great feats despite a troubled past. There are many signs pointing in this direction, from the artist’s futile research into all-but-forgotten sites to the pathos-infused titles vacillating between sincerity and satire. His troubled past is Modernism, which he parallels with industrial manufacturing and labour. This renders his romantic narrative more proletarian than titles like Time Machine for Abandoned Futures (2014) might suggest. The poetics of his titles are amusingly disproportionate to a medium that has not suffered the delusions of grandeur to which painting was so prone. This working man’s romance aligns printmaking with a simpler time, when manpower had not yet been displaced by the service economy of late capitalism—a transition that is paralleled by the de-skilling common to the post-medium condition. A Modern Cult of Monuments seems most closely aligned with the of argument of Yves-Alain Bois, whom Verwoert references in his essay. Bois explains that painting can only have meaning if it is strategically located within an external network of references. It must engage in a simultaneous critique of its symbolic and material vocabulary as positioned within a larger context. One should not understand medium and concept as two metaphorically interacting planes; medium-specific self-critique is understood to do much of the conceptual heavy lifting. However, Verwoert maintains that we are stuck in a stalemate. We force ourselves to “describe the meaning of a painting [or, I would argue, any other medium-specific practice] in metaphors that are drawn from the conceptual field of argumentation.” What then happens to the experience of art? How can we continue to talk about perception and experience in a way that is relevant? Lyons’ carefully arranged inquiry into printmaking via site-specific excavation bears the hallmarks of this strategic use of medium, and perhaps suffers from its pitfalls as well. The artist has developed the conceptual tie between printmaking and industry ever since his first exhibition, Boomtown (2008). Over time, the position of the medium has become ever more tightly bound to its concept and presentation, to the point of rendering itself suspect. 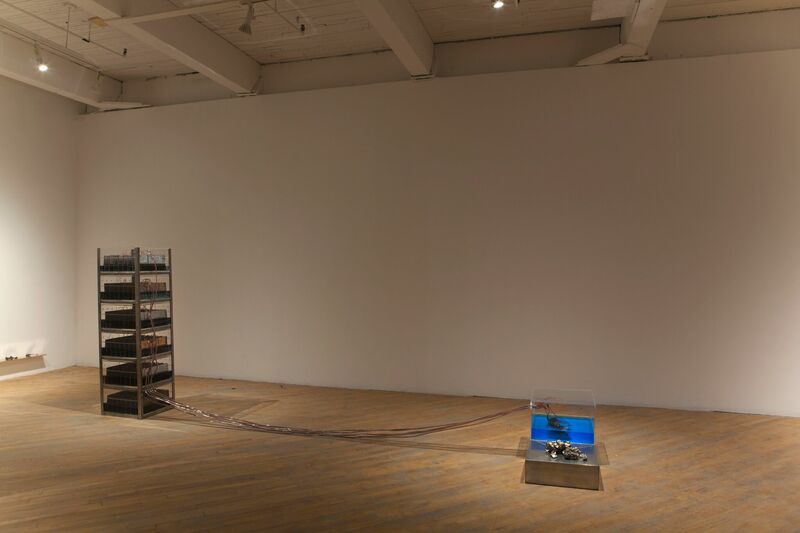 Aesthetic tropes of installation, such as low-lying shelves that make viewers lean in, or deliberate debris placed on the floor, read like efforts to make contemporary a retrograde fascination with material and technique. All the while, the process of printmaking is self-consciously reiterated in the concept of the work, its materiality and the very structures it’s displayed on. I get the sense the medium is being ever more thoroughly explained; it functions discursively and metaphorically. Since Krauss’ pivotal essay, the relevance of other modes of artistic production have also come into question—the biennale boom and commercialization of conceptual art are two examples Verwoert highlights. While this questioning won’t serve to make medium specificity of singular relevance again, it does open new avenues for consideration, or at least some room for unexpected outcomes. Can Lyons’ medium yield surprises outside the nostalgic narratives of former times? Or can the practice of printmaking complicate the narrative of obsolescence that it repeatedly tells? Obviously these questions are not problems for Lyons alone, nor do they have easy answers, if they have answers at all. But perhaps it means medium specificity won’t need to be relegated to a modern cult of monuments, and can function fully in the present. How it will do so will be up to the artist to decide.